I spent a lot of time in home improvement stores when I was little. So much so, that whenever I was homesick in college, I’d go to Lowe’s and wander around. I am the daughter of an electrician and a carpenter by trade. My dad has wired buildings all across the city of Cleveland, including the Quicken Loans arena where LeBron James does his magic. I think that’s so cool! My dad can maneuver on catwalks, stories above the ground, and he can splice high voltage cable, all of which sounds terrifying to me. My mom used to work in construction on buildings and bridges too, and was part of the reconstruction of the landmark Lorain-Carnegie Bridge, here in Cleveland. She even made the grandfather clock in her dining room. So talented. And their daughter? Well, I once assisted in making a pair of stick horses in seventh grade for my little brothers with my parents’ power tools. It was basically 10% me, 90% my mom. I certainly regret not taking the time to learn more from them when I was growing up. Part of it was I was just busy doing other things that I thought would be important when I grew up, not being insightful enough to know that it would be AMAZING to have some actual real, hands-on life skills once I was an adult. But also, part of it was probably that they knew I got splinters just looking at a piece of 2×4, so it saved everyone some trouble. This is still partially the case. BUT, now I have the desire to learn, have a new “This Old House” worth of projects to take on, and over the last few years I’ve been acquiring some tools and trying to figure it out along the way. AND I still believe there is hope for me! If It’s Cold and Gray Today, Get Your Camera Out! The Postal Service Re-thinks its Motto. One of my favorite winter pictures. After a monumental snow in 2008, I happened upon this scene at the post office. I like to imagine the postman’s internal dialogue. What “winter” means to you depends on where you live, of course. I live in the Midwest, where winter is definitely colder, grayer, and soggier, than the rest of the year. Just being honest here, but my favorite season is NOT winter. Statistically speaking, it’s not yours either. But today, for all of our benefits, I thought I’d share how taking pictures has helped me appreciate these months for all their beauty and gifts. After seeing The Peanuts Movie last month and learning Meghan Trainor had her very own Peanut character, I began looking into what it would take to find someone to draw a Peanut version of my husband for Christmas. To my delight, The Peanuts Movie people had created their very own free Peanut character generator. It’s so fun! So, I made one for me too. This month, all month, I’ll be sharing some recommendations for how you can stay spritely this winter…especially in January which I’ve found sometimes requires a little extra effort to fend off cabin fever. Speaking of recommendations, they are one of my favorite things. Collecting recommendations, that is. In my life, I’d have to say most of my favorite musicians, foods, scenic spots, you name it have come at the recommendation of someone else. And also car mechanics, tailors, photographers, wedding cake bakers too. I actually have a note on my phone that’s just titled RECOMMENDATIONS and I fill it up all the time with things other people suggest. I’ve got new grocery store recommendations from neighbors. I’ve got book recommendations from friends. I’ve got restaurant recommendations from complete strangers. I’ve even got bug spray brand recommendations from a former coworker. It doesn’t really matter what it is, if someone’s got something they like so much they want to share the wealth, I want to hear about it. Jacey Verdicchio and Maggie McDaris, who host the Around the Table Podcast have a wonderful little segment called “Read Watch Listen Follow” where they share their current recommendations in each of those categories — from books — to movies — to music — to who or what they’re found enriching to follow on social media. It’s so simple and so perfect, that I’ve adopted it for myself. And, it’s a great set of questions to throw out there if you’re at a dinner party with a table of people who don’t know each other and aren’t talking and you feel somehow compelled to get them all chatty and feeling less awkward in that moment. Just a little tip to throw in your bag of tricks. So, one idea for your new year, if you aren’t already in the habit, is to start stocking up on recommendations. It’s a great way to learn about people – both people you just met or people you’ve known for a long time. And you’ll come away rich with ideas. Read – The Warmth of Other Suns by Isabel Wilkerson. Wilkerson says of the book, “I began this work because I wanted to pull readers deep inside perhaps the greatest untold story of the Twentieth Century. The goal was [to] convey the lives of the people who had dared to make the crossing from the South to all points North and West in what would come to be known as the Great Migration.” Some six million lives that is. It took Wilkerson fifteen years to research and write this book, she interviewed over 1,200 people, and she personally followed the migration routes of the three major characters in the book. That care shows through in her masterful storytelling. Part of me wants to write an all-out review right here and now, but for today it’s not an exaggeration to say it’s one of the best and most important books I’ve ever read. It’s filled in some major gaps in my understanding of American history and the experience of black America. Oh, and it’s hefty but worth it. The audiobook is well read if you’re inclined to go that route. Watch – The Great British Bake Off (BBC). There is currently one season available on Netflix. My mom and I discovered it accidentally. We tore through it…ironically, because it’s so calming. Unlike all the U.S. cooking competitions I’ve become accustomed to — with all the wannabe chefs peacocking around the kitchen talking smack about the other guy’s foraged woodear mushroom bisque or whatever — it’s stunning and refreshing to see these people sweetly and humbly whipping up their three-tiered Victoria sponges with lemon curd without all the accompanying middle school drama. And then every so often the cameras will pan to some sheep or goats in the meadow (because these people are baking in a tent, like you do) while their plaited biscuits rest in the proving drawer. The soundtrack also makes me feel like I should be watching a nature program. And then after the slightly crusty but still somehow lovable judges determine the episode’s winner, there’s lots of hugging and sad goodbyes as one of the bakers has to go home each week. I’ve got one episode left. I’m not even really sure what the prize is. All I know is I love it. Listen – Helen Jane Long, a musician, composer and pianist (also from Britain, while we’re on the subject). Her song “Echo” was playing at the coffeeshop a couple weeks ago so I asked the Barista who the artist was and I went home and found her albums on Spotify. Apparently she worked as Howard Shore’s music assistant for the film score of The Lord of the Rings trilogy and also her music was featured on Volkswagen Passat commercials which makes total sense, because I used to love those too. If you need some peaceful music around the house or while you’re working away on your computer, you might enjoy a listen! Follow – Lea Redmond from Leafcutter Designs. (Leafcutter on Instagram or website). I started following Lea five or six years ago when she was doing a colorful project called “A Pencil in My Pocket” (which you can read about on her blog if you search back for it). But since then I’ve been inspired by the steady stream of interesting and thoughtful creations she comes up with. She is behind the “World’s Smallest Postal Service”, “Knit the Sky”, the “Letters to My Future Self” book, and more. It’s so evident that her creativity is coming from a place of joy and kindness and I’m always excited to see what she’s going to come up with next. Those are mine. How ’bout you?! Feel free to leave any of your recommendations in the comments below for the benefit of the rest of us. And I hope you make many new friends and find many treasures in the pursuit of some good recommendations in 2016. One more New Year’s idea: If you’re looking for a fun new way to think about the upcoming year besides resolutions, check out my Spritely List Guide! Sign up here for the Stay Spritely newsletter and I’ll send the PDF guide your way! In addition to loving that an animated movie took on the task of bringing emotions to life on screen, I love the ways it imaginatively explored the role of memory in a child’s development. It has only left me wishing that an Inside Out 2, 3, and 4 were coming down the pike to tackle these same themes in other seasons of life! Memory, in particular, is one of the most under-recognized yet most powerful things in the human experience and that certainly doesn’t cease to be the case when we’re all grown up. In recent years, I’ve been thinking a lot about memory in my own life — how my memory is evolving as I age — how I’m seeing particular memories through different light — and how I’ve lost some of the details of treasured memories that used to seem so crisp. Especially, I’ve found as the days zip by, it feels like too many little moments in my life slip through into the forgotten abyss in ways that my eleven year-old self would have never let fly! I wanted to hold onto the days, to savor them! So, we decided then that we would be intentional about making the days count and remembering them together too. We’d try our best to appreciate the days as they come and go. To take stock of them. And to take care of the memories that come with them. Our well-worn little blue book. To this end, he gave me a little blue one-line-a-day journal for Christmas the year before our wedding. It has a small lined space to write a snapshot memory of each day, for five years. It’s part of a lovely series of One Line A Day books published by Chronicle Books. AND it’s the perfect journal for someone like me because I am sooooo bad at “journaling” as a daily activity. The beauty of this is that the most I have to come up with is 2 square inches of things to say! Fun fact: when watching Ken Burns’ documentary series “The Roosevelts” I noticed FDR had the very same style of a five-year, line-a-day journal as a young man. In addition to being fun to look back to see what we were doing on a particular day two years ago, it’s also been a helpful way to gain perspective about decisions we’ve made, or things we were mulling over but were too close to the event to see the bigger picture. It’s even been great to jog my memory about what we were eating last fall or summer when we are feeling uninspired in the kitchen! And now that we’ve lived in three different cities since we’ve gotten married, I love that sprinkled throughout this book are a record of the more mundane details of life, like the names of the grocery stores we shopped at or the trains we took to get around. They are the littlest of things, but things that likely would have faded more quickly from my memory otherwise. It does take some commitment to keep up our little book, but I am so glad it is now a part of my daily rhythm. Commit to recording a verbal snapshot every day, BUT don’t make it a monumental task that turns it into a chore. You don’t have to write a Pulitzer Prize winning paragraph. Some days you might have time for one word and that’s just fine. But in a few years when you look back and read “Car battery died. We had a picnic waiting for help” it will prompt the full story in your mind. Some days when nothing noteworthy comes to mind, I will jot down a current event in the news that I’ve been following, a song lyric that’s been in my head, or even something from a tv show we’ve been watching. It’s kind of like a verbal time capsule. When possible, record in specific. It will be fun for you (and if you have kids and grandkids potentially) to look back and know what kind of cake you liked to have for your birthday, or the model of car you bought, or the diner you stopped at on vacation. And record in specific little ways that other people have cared for you, such as when your roommate took out the trash when it was your turn, or when your husband made you your favorite dinner while you took a nap. It’s a way to record love in the little, meaningful ways. When life is feeling a little heavy — or particularly when there is tension in your significant relationships and it colors the whole day — I have found that one way to mark that day is with a quote from a book, a scripture verse, or even a prayer that represents how I hope there will be resolution or light at the end of the tunnel. Because, let’s be honest, there are going to be days. If you miss a few days, don’t despair. It’s still worth keeping on! One way you can keep up, especially if you are out of town and don’t bring your book with you, is keep a note on your phone. Sometimes if I miss a day, I can jog my memory by looking back at text messages or emails. But either way, the main thing is to just keep jotting down memories while they are fresh. Another fun fact: FDR missed some days. After you’ve been recording the days for a while, take some time, either at the beginning of a new year, or perhaps an anniversary to flip through the book with your family or friends or whoever are subjects in your memory book. Shared memories create meaningful connections between people, and this is one way you can make sure those memories don’t slip through the cracks. A lot can happen in a year. If you are a human who has just finished up another calendar year, I am 100% positive that there have been some challenging things and some wonderful things in some proportion this year. My hope for you at the close of 2015 is that you will have some time to reflect on it all, to pause in gratitude for all the good stuff, to grieve the losses if that still needs to happen, to laugh at the things that were ridiculous, and to gather up some of the memories you want to take with you from this trip around the sun. May you have a hopeful and happy New Year, friends! Jussssssst in time for The Force Awakens release, you can wow all your neighbors with some classic X-wing or Storm Trooper snowflakes in your window! Here’s my Yoda! I love how he turned out. Anthony Herrera Designs has some incredible designs for free download. (He’s also got Guardians of the Galaxy and Frozen designs as well. How are these not all over the the internet right now?! Impressive stuff, Anthony!) And he makes a new set each year, so click on his links for previous year’s designs. For these and the more intricate of the batch below, I enthusiastically recommend an X-Acto knife and a mat if you don’t want to drive yourself crazy with the scissors. Nobel Physicist Snowflakes: How about an Albert Einstein, a Marie Curie or an Erwin Schrödinger (cat included!)? Find the downloads here at Symmetry Magazine. Disney’s Frozen: For some reason, the Frozen (UK) site has a much wider assortment of free resources than their U.S. counterpart. Find and click on the snowflake template printable with 6 different Frozen snowflakes, including of course, Olaf! 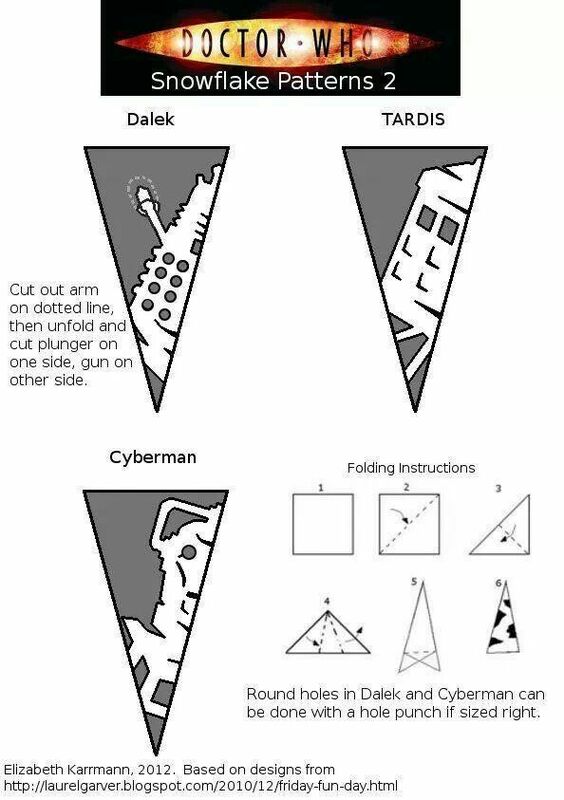 These are great because you should be able to do all of them with just scissors. Game of Thrones: Here are ten Game of Thrones themed snowflakes from Krystal Higgins. Scroll to the bottom for the printable designs. A few from the Frozen Collection. I love Olaf’s little tufts of hair. Snowflake Dancers: I also love these ballerina snowflakes. I think I will attempt a few this weekend. 3-D Snowflakes: And these twisty and twirly ones are on my list too! Those are my snowflake discoveries thus far! If you know of any other good ones, share a note below in the comments. And if you’ve got family coming in next week and you’re not sure how to occupy all the time, might I recommend a giant stack of white paper? Follow me on Pinterest, I just created a board just for snowflakes and I’ll keep adding more as I find them! I accidentally knocked out a couple of C3PO’s eyes. We’ll pretend that is winking. I started keeping my “Spritely List” as a sort of appendix to the annual plan I had to turn in for my job each year. At the time, I was feeling a little down on my life — lacking in expendable income, a city girl living in a rural area, friends scattered across the country after college, and feeling like I was being sent out to pasture at the ripe old age of 22. Those were the colors of my young adult glasses, anyways. SO, to ward off the blues, I promised myself that I would make the effort to look around me for adventures, and for friends to enjoy them with. AND I promised myself I would make the time and find the resources to do something on my list at least once a month. Without my list, I don’t think that I would have ever started a dinner club and made a bunch of wonderful friends in the process, or made space in my schedule to take a Pilates class, or saved up for shoestring budget but priceless trip romping around some incredible places in Europe I’d only read about in my textbooks. Those things I wrote down became priorities for me, and I’m so glad! And my list has evolved and changed over the years, especially as I’ve moved on to new places and new seasons in my life. I look forward to sharing bits and pieces of what I’ve learned right here on this site. Want to Make Your own Spritely List? I am excited to share some of the things that have helped me create my list, so you can make one tailored just for you. I created The Spritely List Guide with you in mind. If you sign up for the Stay Spritely e-newsletter, the PDF will be sent to you for free! It’s the perfect thing to sit down with before the start of the new year, with a warm drink in hand. No matter what your life looks like right now, I’ll help you gather ideas and possibilities to look forward to in the coming year. And I hope it can be a resource you can keep coming back to for ideas and inspiration. Enjoy!